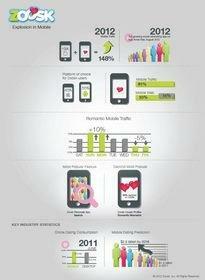 Zoosk, the romantic social network, today announced it has hit a number of key mobile milestones. In the last year, mobile traffic on HTML5 and mobile apps has increased by 148 percent. In an effort to advance its mobile strategy and presence even further, Zoosk has also released an HTML5 version of Zoosk.com to ensure its service is accessible on all mobile devices. Zoosk analyzed its mobile data to demonstrate the usage breakdown between iOS and Android; mobile and web usage; what day users are most engaged; what features are most popular on mobile; and mobile traffic increase year-over-year. Android is the platform of choice for Zoosk users accounting for 55 percent of mobile app usage, while the iOS platform claims 45 percent of mobile traffic. Usage on Zoosk's native mobile apps accounts for 61 percent of mobile traffic, while 55 percent comes from mobile web, indicating an overlap of 16 percent. Mobile traffic is about 10 percent higher on Sundays and Mondays making these the most popular days for mobile use. Thursdays and Fridays are down days for mobile romance accounting for 5 percent lower traffic than average. Searching is the most popular use of Zoosk's mobile Personals app and users, on average, initiate one new connection a day. For those in a committed relationship, the most popular use of Zoosk is to post their romantic moments on their joint couple profiles, with 23 percent of all moments being captured on mobile devices. "We are committed to offering our users a seamless way to create and share their romantic journeys through our social network," said Shayan Zadeh, co-founder and co-CEO, Zoosk. "Over the past few years, we have seen a tremendous growth in the use of our mobile applications causing our team to enhance our mobile offerings to suit the needs of our on-the-go customers. Zoosk has had a platform agnostic approach from day one. We will be where the consumers are which means a broad suite of mobile products covering native applications to HTML5 products." "Mobile phones have transformed into our wallets, personal shoppers, televisions, books and even matchmakers with the growth of mobile dating," said Julie Spira, author, online dating expert and founder of CyberDatingExpert.com. "As consumers continue to grow accustomed to using their phones to access their favorite sites and services, Zoosk has seen an increasing demand for mobile access from its members. In response, the romantic social network's mobile app provides its users with the ability share their romantic journeys on-the-go, while still offering the same quality user experience people get on a computer." Zoosk is the romantic social network that helps members create and share their romantic journeys, with millions of members from around the globe enjoying the service each month. Zoosk provides members at different stages of their romantic journey with a fun and social set of tools such as Romantic Moments, Couple Profiles, and the Personals application. Members can easily access Zoosk's services from its website, its Facebook app, mobile devices, and a downloadable desktop application. Zoosk is available in 25 languages and has members in more than 70 countries. Founded in 2007 by Shayan Zadeh and Alex Mehr, Zoosk, Inc. is based in San Francisco and backed by Canaan Partners, Bessemer Venture Partners, and ATA Ventures.